The Murdoch scandal has been extensively reported as a telephone hacking police story. Only in the JTA, the Global News Service of the Jewish People, has coverage of the Murdoch News Corp story sounded the traditional Jewish mother’s alarm: “uh oh, this will not be good for the Jewish people”. Kampeas assumes, correctly I am sure, that his readers do have a strong interest in Murdoch’s “sudden massive reversal of fortune”. They have reason to be alarmed. Without Daddy Murdoch’s formidable pro-Israel presence, that pesky UN September vote could tilt toward the Palestinians. After that, Israel-Palestinian border negotiations might find a disgraced Murdoch-controlled British government eager to prove its independence. Without Murdoch, Fox News will have lost its most reliable news producer. These allegations threaten to severely weaken Murdoch’s media empire, an empire the Australian built which now includes The Wall Street Journal, the Times of London and The Australian. Murdoch also owns two major tabloids, The Sun in Britain and the New York Post. In the US, Murdoch owns and virtually writes the scripts for the Fox News Channel. Until he recently sold it, Murdoch also owned The Weekly Standard, the neo conservative magazine he created in 1995. Admirers of Murdoch’s aggressive take-over of news outlets have praised him for revitalizing the news industry. What they overlook is that his “revitalizing” has also lowered the standards of the journalism profession. It is the Murdoch style to view the world through black and white lens, “West good, Muslim East bad”. For the Murdoch media empire, accuracy is never as important as racist sensationalism. Glenn Greenwald reports in his Salon column this week-end how both the New York Times and the Washington Post incorrectly blamed “Muslim extremists” for the Oslo, Norway, attacks, retaining on line, false racist accusations later shown to be incorrect. The Post’s Jennifer Rubin cited The Weekly Standard as a source for her false reporting, a dive into the Murdoch pool of sleeze for which the Atlantic’s James Fallows calls her to task. Before the hacking scandal broke, Murdoch had expanded his empire into the Middle East, choosing, as no surprise, to connect with a Saudi prince Aljazeera recently described as ” the 26th wealthiest person on the planet, as well as the richest man in Saudi Arabia, billionaire Prince Walid bin Talal bin Abdelaziz Al-Saud, a nephew of King Abdullah of Saudi Arabia”. Forbes magazine reports that Prince Walid has a net worth estimated to be at least $19.6bn. Aljazeera also reports that the Prince is the second largest shareholder (at seven per cent) in News Corp, second only to Murdoch. How close are the two men? During a recent interview on his yacht with the BBC’s Newsnight, Prince Walid declared himself to be a “good friend” of Rupert Murdoch and his son James, and staunchly defended the men amid the ongoing News Corp scandal. It is noteworthy that, while Prince Walid is the second largest shareholder in News Corp, Murdoch is also a major shareholder (ten per cent) in Prince Walid’s Rotana Media Group based in the Middle East. As recently as this May, Murdoch’s conglomerate took a significant stake in Prince Walid’s film, TV, and music business, a move that deepened the financial relationship between the two men. The Saudi connection, however, will be of little help in Murdoch’s dealing with the British and possibly, the American, legal systems. Kampeas writes that “Jewish leaders” fear that any reduction in Murdoch’s media influence could “mute the strongly pro-Israel voice of many of the publications he owns.” Those “Jewish leaders” rely on Murdoch to reassure them that all is well in the world of political Zionism. These comments suggests that what happens to Murdoch in the future is significant to supporters of Israel not primarily because of the alleged immoral or illegal violations of the public good, but because of the potential impact on the pro-Israel voice of Murdoch’s media empire. If there are US media outlets, other than JTA, which have included Murdoch’s Zionist zealotry in their hacking scandal stories, I have been unable to locate them. The Big Three PEPs, (Progressive Except for Palestine) Maddow, Matthews, and O’Donnell, are progressive voices on MSNBC-TV, but they will absolutely not touch the sins of Israel, the third rail of American politics. Rachel Maddow, my favorite of the Big Three, appeared uncharacteristically oblivious of what she was saying in her recent interview with Bill Moyers. To MSNBC’s Rachel Maddow: On your show of July 14, you spoke of your complete freedom to say what you want on your show and Bill Moyers gently demurred, speaking of restricting forces that hover over journalists. Bill Moyers was correct. I cannot believe you don’t care, but you are not free to address on your show the political influence of the Israeli lobby (which is far broader than AIPAC, the American Israel Public Affairs Committee). For Maguire’s complete list, click here. The Big Three constantly feast off the right wing shallowness of Fox news readers and commentators, but they do not venture even close to the linkage between Murdoch’s strong pro-Israel bias, and his threatened downfall. Kampeas, on the other hand, is quite forthright about the linkage and its potential damage to Israel. Note how eager Kampeas is to cast Murdoch in a favorable light by citing “Jewish leaders”. Murdoch has visited Israel many times, always meeting, of course, with Israeli leaders. He is equally well received by “Jewish leaders” in the US. In 2009 he was honored by the American Jewish Committee. 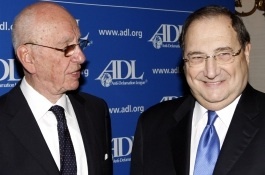 On October 13, 2010, Abraham Foxman of the Anti-Defamation League (shown at right in this picture with Murdoch) hosted a dinner in Murdoch’s honor. My own perspective is simple: We live in a world where there is an ongoing war against the Jews,” Murdoch said last October at an Anti-Defamation League dinner in his honor. “When Americans think of anti-Semitism, we tend to think of the vulgar caricatures and attacks of the first part of the 20th century. Now it seems that the most virulent strains come from the left. Often this new anti-Semitism dresses itself up as legitimate disagreement with Israel. Murdoch is popular with conservatives in the US but highly unpopular with the progressive community, as the Nation magazine’s John Nichols was eager to demonstrate in his recent story on the scandal. Australian-born billionaire Rupert Murdoch has manipulated not just the news but the news landscape of the United States for decades. He has done so by pressuring the Federal Communications Commission and Congress to alter the laws of the land and regulatory standards in order to give his media conglomerate an unfair advantage in “competition” with more locally focused, more engaged and more responsible media. It’s an old story: while Murdoch’s Fox News hosts prattle on and on about their enthusiasm for the free market, they work for a firm that seeks to game the system so Murdoch’s “properties” are best positioned to monopolize the discourse. Even with such a strong progressive as Nichols, there is still no mention of Murdoch’s strong Zionist passions in his story of the scandal. When he testified before the House Judiciary Committee in May of 2003, Murdoch was seeking to secure ownership of the nation’s largest satellite television company. Nichols writes that Murdoch was pressing for FCC rule changes that would allow him to own newspapers and broadcast outlets in the same cities. His goal was to ease controls so that “one corporation could dominate television viewership nationally”. Progressive writers like Nichols want to make it clear that the right wing Republican party has a deep affection for a strong man like Murdoch whose media empire is dedicated not only to making money but to the promotion of a conservative ideology. You have to love the fact that when John Yates resigned on Monday as the assistant commissioner of the Metropolitan Police in London — a k a Scotland Yard — he complained about the “huge amount of inaccurate, ill-informed and, on occasion, downright malicious gossip” that had finally forced his hand. . . . When the writers and editors of the late, unlamented News of the World were busy bribing Mr. Yates’s police officers, what they wanted in return was — gosh! — malicious gossip. When they were hacking the phones of royal family members and murdered teenagers, they were seeking, you know, malicious gossip. When the recently arrested Rebekah Brooks called Gordon Brown, the former prime minister, to tell him that Rupert Murdoch’s Sun, which she then edited, was about to reveal that his infant child had cystic fibrosis — information that Brown is convinced came from a hacked phone message — she was telling him the paper was going to print a piece of gossip that a more humane institution would have let pass. She might not have viewed this as malicious, but the Brown family certainly did. . . . . In her native Australia, “Elisabeth is held in high esteem as one of the country’s most beneficent philanthropists,” a sharp contrast to the “sullied reputations of Rupert, and her grandson James”, both now under intense police scrutiny. When Elisabeth’s husband Rupert, Senior, died from cancer in 1952, she turned her attention to charity work. She became life governor of the Royal Women’s Hospital in Melbourne and helped to set up the Murdoch Children’s Research Institute. Consistently, however, she has expressed strong disagreement with the policies of News Corp. Nine years ago, for example, she told Julie Browning, author of A Winning Streak: The Murdochs, that her son’s purchase of the News of the World, “nearly killed me”. In the US, Fox News, and more recently, the once highly respected conservative Wall Street Journal, have emerged as “house organs” for right wing Israeli governments. If Murdoch self destructs, Israel will have lost a major weapon in its hasbara (propaganda) arsenal. Whether that is “good for the Jewish people”, depends entirely on your definition of “good”. The mainstream media have done a terrible disservice to the American people by their slavish reporting as the mouthpieces for Israel, and to completely ignore the cruelty that Israel has inflicted, and continues to inflict, on the Palestinians day in and day out for decades. They routinely fail to report on Israeli house demolitions, land confiscations, and settler and Israeli army violence to the men, women and children of Palestine whose only sin is not being born Jewish in Israel/Palestine. Rupert Murdoch and hsi media empire are not the only shills for Israel. The NYTimes, the nations “paper of record”, has also been the voice of Israel for decades. As you indicated Jim in your piece, even th “big three on MSN TV, refuse to touch the power of AIPAC or Israeli crimes. Unless the mainstream media stops protecting and propagandizing for Israel, the American people will remain in their comfortable ignorance on this issue. We can and should write to them often to point out their lack of journalistic integrety, and demand honest reporting on this issue. Will it only change however, when zionists in high places in the media allow it? Thank you for your story! It has been said that everywhere, but in the U.S., this is a big and important story. 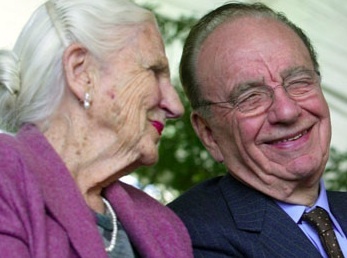 Sadly, Murdoch’s wife’s right-hook is getting all the attention and new found popularity. We ‘ve got a long way to go in many regards, don’t we? Thanks Jim, for a very informative piece on the Murdoch scandal, especially in terms of just how far his tentacles reach and possible implications on Middle East news coverage in the US. While I agree that Murdoch is a major weapon (a WMD) in destroying constructive, unbiased, and fact-based discussions around Palestine and Israel, I’m less optimistic about what his demise would mean for US coverage. As you mentioned, the big 3 of Maddow, O’Donnell, and Matthews won’t touch the issue. While removing Murdoch from the equation may simultaneously remove some of the most racist and incendiary rhetoric, I just don’t know that in its place will emerge honest reporting on Palestine. The go-to position on this issue is cowardice, whether it’s from the hard right or the so-called neo-liberal or progressive left.